The competition is open to Sindhi Indians residing in India and outside. The participant should be a student between the age of 15 years and 25 years as on 30th November. The entries will be accepted from 1 July 2016 6:00hrs IST to 30th November 2016 23:00hrs IST. The videos sent for contest shall be the property of Sindhi Sangat. The videos will be evaluated by a panel of 3 professionals from the field of video/filmmaking. Any member of Sindhi Sangat or their family members are not allowed to participate. 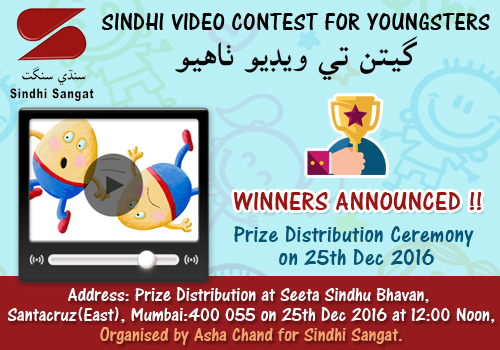 Click Here For FAQ Sindhi Video Contest For Youngsters. Address: On 25th December the prize distribution is at Seeta Sindhu Bhavan, 8, Ram Panjwani Chowk, Santacruz (E), Mumbai- 400055. Organised by Asha Chand for Sindhi Sangat.